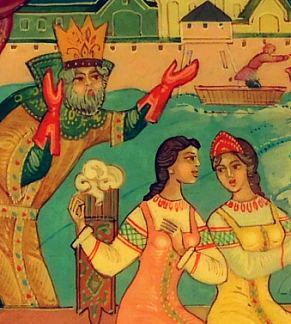 from Mstera by B. G.
"Had I been the tsar's wife, I would prepare a fabulous feast for the entire world!" boasts one sister. "And I would weave a beautiful carpet that would cover the whole world! ", responds the second. The third sister, standing aside, humbly remarks that she would bear the tsar a handsome and brave son. And it is she who will become the queen and face the dreadful consequences of her sisters' jealousy. 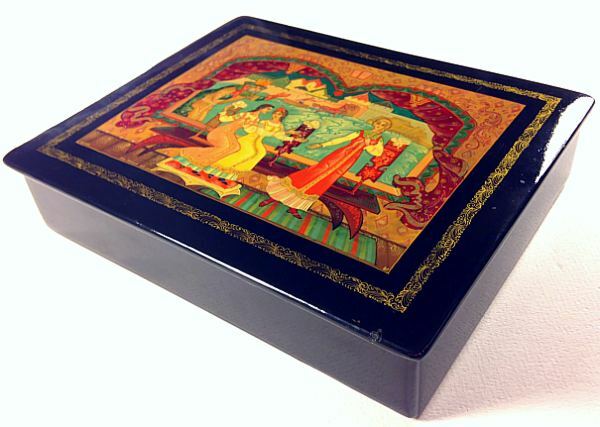 The opening scene of this famous Pushkin fairy tale is depicted vividly on this box: the Tsar, who happens to pass by, raises his hands in awe as he overhears the conversation; the courtyard on the background, and the man transgressing it in a one-horse sleigh aid the cozy and casual mood of the piece. Traditional colors - burgundy, coral, teal, and golden are used to convey the atmosphere of the tale. The box is made from papier mache. It is hinged at the top and sits flat (no legs). The interior is red. Signed with author's initials, name of the work ("Three Maidens by the Window") and village. There is a small dent in the right corner of the lid. Otherwise lacquer is in good condition.